Twiggy motor starters sell for $2.25 each. The Twiggy motor starter is designed for those 29mm “F” and “G” class Single Use or RMS motors. Its unique oval shape and the 22-gauge wire allows for insertion through the smaller nozzles to bottom out into the “C slot” grain geometry found in these engines. Approximate measurements: 1/2 inch long and 1/8 inch OD (.125) at the widest point. 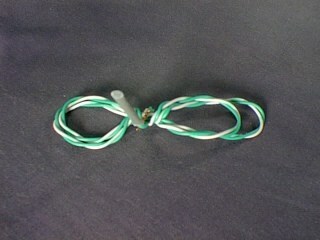 The thickness of the oval is approximately 3/32 inch (or .093) with 15-inch leads. Using 12 volts, these high energy motor starters will burst into flames with rapid combustion, similar to a sparkler, and burn at about 1,600degrees F. They will reliably start sugar motors, composites, black powder or anything that will burn. Moisture and shock resistant. Twiggy motor starters are most commonly used with club type 12 volt Launch Controls. Usually three can be clustered at once, ground test to be sure your launch control is up to the task.